If you have your own tips, it would be great to hear what works for you! My thoughts are with anyone who has a therapy break upcoming…. Categories: Therapy | Tags: borderline personality disorder, BPD, coping with therapy breaks, missing therapist during breaks, self-care strategies, summer therapy break, therapeutic relationship, therapy, therapy break | Permalink. Over the last eighteen months or so, I have found myself developing a number of strategies for trying to cope with therapy breaks, and in particular the long summer break, which for me tends to be between four to six weeks long. I recently summarised thirteen of those strategies in a two-part post for the therapy website welldoing.org, and this is the link to the first part, containing my first six tips. I hope you find them useful! The house on the far left is The Marsh House (Marnie’s house) – or rather, the house that inspired the book ‘When Marnie was there’. 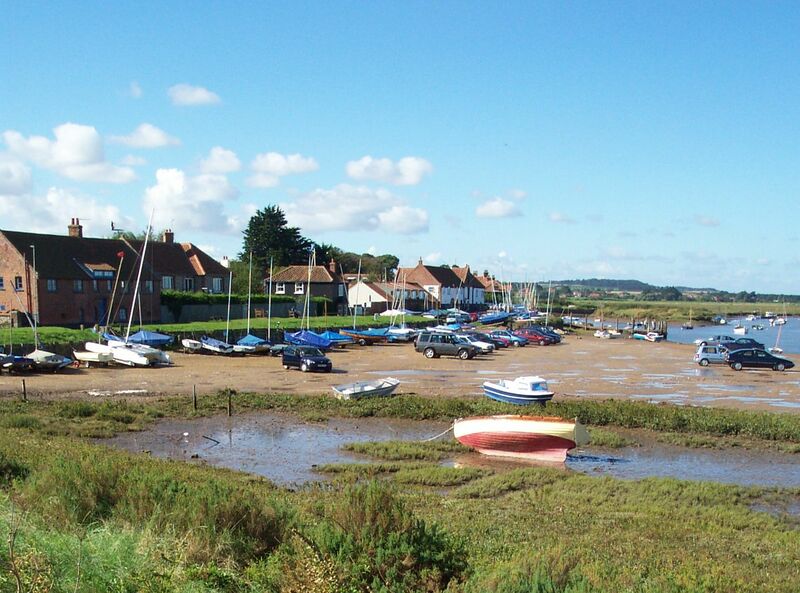 The house is located in Burnham Overy Staithe, in Norfolk (or ‘Little Overton’, as it is referred to in the book). Photo is by Chris Wood (User:chris_j_wood). [GFDL (http://www.gnu.org/copyleft/fdl.html) or CC-BY-SA-3.0 (http://creativecommons.org/licenses/by-sa/3.0/)%5D, via Wikimedia Commons . A few weeks ago I wrote a post about rediscovering a book that I read as a child, the memory and impact of which stayed with me, even though I could not remember anything apart from the name ‘Marnie’ in the title. The book was called ‘When Marnie was there’, and I have now read it twice within the space of a month. The first time I read it, I cried for almost an hour after I finished it, but for no reason particular reason that I could identify. The second time, as I read it I turned over the tops of pages which contained sentences or paragraphs that particularly struck me or rang true. I am still trying to understand the power of this book which means so much to me. I know without a doubt that I saw (and still see) myself in Anna, the book’s main character. The way she defended herself from the world and from her emotions, following on from loss, mirrored my own response as a child (and not only as a child). When I read it for the second time, I think I was looking for something redemptive, in the way that Anna had begun to be transformed through her encounters with Marnie, the little girl who lived at The Marsh House. There are thoughts beginning to take shape in my mind, and a post starting to form. But I am not quite there yet. What I have felt compelled to do, is write down all those passages that struck me. And that is what I did tonight – I went through every page with a turned-down corner, and typed those sections out, and am copying them below. I hope you will forgive this post, therefore: both for its insularity (for without being me and without knowing why these passages chimed with me, they may appear rather random); but also for what it gives away. I very much hope that these passages will encourage you to obtain a second hand copy of the book and to read it, rather than feeling as though I have spoiled it by revealing some of how it unfolds. There are still important plot points and many other beautiful and frightening components of the story that I have not given away. Even without knowing the story, and without knowing my own internal context, I hope that these passages hang together. All I can say is that they must have hung together in my sub-conscious, and this is my attempt to figure out why. For greater clarity, I have used italics purely to separate out paragraphs a little more, and to show where one quoted section ends, and another begins. I hope I am not infringing copyright law by quoting to such a degree! She could only stand there stiffly by the open door of the carriage, with her case in her hand, hoping she looked ordinary and wishing the train would go. Mrs Preston, seeing Anna’s ‘ordinary’ look – which in her own mind she thought of as her ‘wooden face’ – sighed and turned her attention to more practical things. Already the turmoil of Liverpool Street Station, the hurry, the confusion, the nearness of parting – against which she had only been able to protect herself with her wooden face – seemed a hundred years ago, she thought. There was a picture over the bed, a framed sampler in red and blue cross-stitch, with the words Hold fast that which is Good embroidered over a blue anchor. Anna looked at this with mistrust. It was the word ‘good’. Not that she herself was particularly naughty, in fact her school reports quite often gave her a ‘Good’ for Conduct, but in some odd way the word seemed to leave her outside. She didn’t feel good…..
And then she saw the house…..As soon as she saw it Anna knew that this was what she had been looking for. The house, which faced straight on to the creek, was large and old and square, its many small windows framed in faded blue woodwork. No wonder she had felt she was being watched with all those windows staring at her! Sitting alone on the shore….she looked back at the long, low line of the village and tried to pick out The Marsh House. But it was not there!…..Alarmed, she stood up. It had to be there. If it was not, then nothing seemed safe any more….nothing made sense….She blinked, opened her eyes wider, and looked again. Still it was not there. She sat down then – with the most ordinary face in the world, to show she was quite independent and not frightened at all…….as they rounded a bend in the creek and she saw the old house gradually emerge from its dark background of trees, she felt so hot and happy with relief that she nearly said, ‘There it is!’ out loud. She realized now that it had been there all the time. Then as they rounded the last bend, she turned as she always did, to look towards The Marsh House…..They drew nearer, and then she saw, quite distinctly, in one of the upper windows, a girl. She was standing patiently, having her hair brushed. She ignored the hand, pretending not to see it, but in that instant she longed to flop down on the floor beside him and tell him everything. But she could not have done that without crying, and the very idea of such a thing appalled her. Anyway they would miss the point somehow. Mrs Preston always did. She was always kind, but also she was always so terribly concerned. If only there was someone who would let you cry occasionally for no reason, or hardly any reason at all! But there appeared to be a conspiracy against that. Already she had spent many afternoons here, lying in a sandy hollow, hearing only the wind rustling the tops of the grasses, the distant crying of the gulls, and the soft soughing of the sea. It was like being at the very edge of the world. Sometimes the gulls came nearer, screaming noisily as they quarelled over small fish in the pools, and sometimes they cried mournfully far away along the beach. Then Anna felt like crying too – not actually, but quietly – inside. They made a sad, and beautiful, and long-ago sound that seemed to remind her of something lovely she had once known – and lost, and never found again. But she did not know what it was. Nothing had been said at the cottage about Anna staying out so late, and having to be brought home by the Beales. All that day, and the next, she went about quietly, steeling herself against reproaches and scoldings that never came. And gradually she thought she understood why. Mrs Pegg knew now that Anna was not worth bothering about. And this was her way of dealing with it – by saying nothing at all. She was tired of Anna…..This was not so, but Anna was not to know. At home things had a way of lingering on. They were not necessarily referred to, but you could feel them in the air…..Mrs Pegg appeared entirely unconcerned. This, thought Anna, could only mean that she had abandoned her, because she was too bad to be worth bothering about. She had not seen Marnie since the party three nights ago, and The Marsh House had been silent. She glanced towards it now and saw that it seemed dark and asleep. The suspicion entered her mind suddenly that perhaps the family had gone away without her knowing…. ‘Marnie! I thought you’d gone away.’ ‘Silly, I live here.’ ‘But I never see you.’ ‘Goose, you’re seeing me now’……‘I’ve been so lonely’, said Anna, surprised to hear herself saying it- it was so rare for her to confide in anyone. They lay, side by side, sucking the ends of grasses, while the wind roared by over their heads, scarcely stirring their hair. In the sudden quiet, Anna murmured ‘You are lucky. I wish I was you.’ ‘Why?’ Anna wanted to say, because you’re pretty and rich and nice, and you’ve got everything I haven’t, but she was suddenly tongue-tied. It would have sounded silly. Marnie moved nearer and touched her hair. ‘Dear Anna, I love you. I love you more than any girl I’ve ever known’. She wiped the tear away and said, suddenly gay again, ‘There! Does that make you feel better?’ Anna smiled. Yes, she did feel better. It was as if a weight had been lifted off her. Running back across the fields with Marnie, she felt as light as air. They were on the far side of the marsh, where sea lavender and marsh weeds gave way to hard sand. Here, when the tide was out, they spent hours altering the course of steams, and making tiny villages out of mud and sand. Even before a house was complete Marnie would start making a garden for it, collecting springs of sea lavender to make bushes, and wild harebells to stick along the sides of each minute garden path. When, next day, they found the tide had washed it all away, she was undismayed and would start on another all over again. But Anna was always a little regretful for the lost houses. She put her cheek against Anna’s for a second, then ran on. Anna had to be satisfied with that, Marnie loved her best, and would rather be with her. That was all she had wanted to hear. She paddled across the creek and saw that the windows of the house were in darkness after all. But that did not mean they had gone away; only that they were round the other side. She thought of the dark drive and the forbidding front entrance on the main road. Edward, and all the other guests, were welcome to that, she thought happily. She and Marnie shared the side of the house that she liked best, the quiet, secret side that had seemed to recognize her when she first stood dreaming by the water, the side that looked as if it had been there for ever….. It was exasperating to wait for hours in the chosen place, only to have Marnie pop up on the way home. Surely she used not to do this? Anna could not remember, but it began to feel as if Marnie was playing hide and seek with her. ‘I can’t be everywhere all the time. And I’m here now. Come on, let’s be friends’. But Anna did not feel like being coaxed. ‘It isn’t fair’, she said. ‘I need you more than you need me’. ‘Nonsense. I need you, too, but you don’t understand – I’m not free like you are. Don’t let’s quarrel, darling Anna!’ Then Anna’s resentment melted away, and they were happy again. But she began to realise that she must not rely on Marnie too much. That if she was over sure of meeting her, that would be the time she would not come. That it was almost as if Marnie was determined Anna should never take her for granted. And yet sometimes they were as happy together as they had ever been. Marnie murmured, so low that it might almost have been the wind blowing over the grasses, ‘You are lucky. I wish I was you.’ Anna turned to her, suddenly quiet. ‘That’s what I said to you – last time we were here’. ‘Did you?’ ‘Yes, don’t you remember? Oh, poor Marnie! I do love you. I love you more than any girl I’ve ever known.’ She put out a hand to touch Marnie’s hair, then stopped in mid-air. ‘And that’s what you said to me’, she said slowly, with a surprised look on her face. ‘How funny, it almost seems as if we’re changing places’. But how could Marnie have gone without even a word? Anna could never forgive her for that. And she would never trust anyone again. The hurt inside her hardened. She pushed away the tray and lay down again. Then, turning her face to the wall, she closed her mind to everything. She turned again to the window. Marnie’s face had disappeared completely, blotted out by the blinding rain. But she waved wildly, trying to smile a good-bye, and pointing along the narrow strip of shore, which would soon be covered. And suddenly, as she looked, it seemed to her that the house was empty after all. That there was no one behind any of those blank staring windows. It looked like a house that had been empty a long time….. Since her illness a shutter seemed to have come down between her and everything that had happened to her just before she was nearly drowned. It seemed now as if it had all happened a long time ago. Sometimes she almost felt as if she were seeing Little Overton for the first time. Then she would remember Marnie. Marnie had gone. There was no doubt about it. As soon as she saw The Marsh House again, Anna knew for sure. She stood for a long while gazing at it, wondering what was different, and could find nothing specific. The house just looked empty. She was not surprised. She had known in her heart that she would never see Marnie again. But secretly she mourned for her. Coming across the marsh at low tide one afternoon, she found an old lady sitting on a camp stool, sketching. She stood behind her for a moment, quietly watching, and saw that she was painting the staithe and The Marsh House. The lady turned and glanced up at her, and smiled. Instead of slinking away, as she would previously have done, Anna found herself smiling back…….‘I love that old house, don’t you?’ said the woman. ‘Yes’, Anna said. The woman turned back to her painting. Anna waited, wondering if she would turn round again, but she didn’t, so she crept quietly away. But she was pleased and felt as if she had made friends with someone just by not running away. Coming to the front entrance of The Marsh House she was surprised to find the iron gates wide open….following the bend in the drive she came in full view of the house, and stopped and stared. She had never imagined it would look like this. It was just as attractive as the old house by the water. For some reason she had always thought of the front as if it were some quite different place. Now, for the first time, she realized what she must always have known really; they were two sides of the same house. And this side was, if anything, even more attractive. It had a warm, welcoming look which she had never expected. Two sides of the same house…..One facing out on to the main road, the other looking back over the water…..And so strongly had she been attracted to the backward-looking side that she had even, for a while, mistaken it for the front. She wondered how she could have been so silly. But then, the gates had always been closed before, so how could she have known? She lay down on her back in a hollow, feeling suddenly lonely, and wept for Marnie. The sad, long-ago sound of the gulls crying in the distance brought real tears now, and they fell from the corners of her eyes, trickling down the sides of her neck and wetting her hair before they sank into the sand. But even as she wept, a new and delicious sadness was creeping over her. The sadness one feels for something enjoyed and now over, rather than for something lost and never found again. A sandpiper flew overhead calling ‘Pity me’ but its cry was now like a little lament for Marnie rather than an empty pity for herself. Comforted by her own tears, she lay there until the sun had dried them…. For a moment she found it impossible even to imagine Mrs Preston at The Marsh House, but the more she thought about it, the more she wanted her to come. She wanted her to see the Lindsays, and she wanted to see her with the Lindsays. If they liked her and she liked them, then – even if only for an hour – Anna’s two worlds would be joined into one. At the back of her mind, too, was a thought she had not yet allowed herself to think about seriously. Her holiday could not last for ever. It was already August, and although the subject had never actually been mentioned, she knew she would have to go home again before next term began. It was raining harder now and she was beginning to get wet, but it did not matter. She was warm inside. She turned and began running back along the dyke, thinking how strange it was – about being ‘inside’ or ‘outside’. It was nothing to do with there being other people, or whether you were ‘an only’, or one of a large family….it was something to do with how you were feeling inside yourself. The wind made a roaring noise in her ears as she ran, and she shouted and sang at the top of her voice. She remembered once, some summer morning – when had it been? – running along a dyke in a wind like this, and feeling the same sort of happiness. Then she remembered. It was when she had been with Marnie, that first time they had gone mushrooming – that first time they had been real friends. For an instant she fancied she saw someone – a little girl with long, fair hair– waving to her from one of the upper windows of the Marsh House. But there was no one there…..It was the end window – the window that had once been Marnie’s…..She stood for a moment, watching the rain falling slantwise across the house and streaming in rivers down the window panes, wondering what it reminded her of. Then she remembered that, too. Categories: Poems, quotes and music | Tags: book review, borderline personality disorder, BPD, creativity in therapy, impact of children's books, joan g robinson, the power of metaphor in therapy, therapeutic relationship, therapy, when marnie was there | Permalink. Once again I find myself in the position of not being able to write about what I thought I was going to write about. This is not turning out to be at all the way in which I thought my posts about email contact with my therapist, would go! Once again I find myself wanting to write about how I feel, rather than how this reduction in email contact with my therapist, has come about. Writing seems to be mirroring the therapeutic process – I may have an idea of how a session will go, or what I want to talk about, and then things turn out differently. When I am able to follow my instinct and the thread that presents itself, rather than worry about the unexpected and about things left uncovered, it is usually helpful….. I did manage to go from Friday to Tuesday between sessions, without any email contact with my therapist. Despite the temptation to do so, I didn’t send any messages. But, as in the image that came to mind during my yoga class last weekend – in which my therapist was trying, but could not get through in order to comfort me- I have felt defended all week. I have been completely open about it, and I’ve said that I wished it weren’t the case. In that sense, it hasn’t created the barrier between me and my therapist that a more unconscious type of resistance can do. The image in my mind all week was of a little wall around me – a very low one, but still enough of a barrier to make itself felt, at least internally. I don’t even know if my therapist would have been able to tell it was there, if I hadn’t mentioned it. Would she have said, as she has done in the past, that I was keeping her at arms’ length? Is that how it felt to her? Or was the barrier mostly present in my mind? Was it mainly closing me off from myself, rather than from her? I came in to session on Tuesday and asked: “Did you think of me?”. You laughed, fondly (I like to think). You asked why I would assume that you hadn’t thought of me, and said that my challenge was to keep you in mind, and not to ‘kill you off’. I asked if you’d read my blog post, and you had – you said you had wondered how I was getting on. So you had thought of me, then. “So you know how I got on’” I said. This has been a strange sort of week. Already, with only one out of three sessions over, I felt as though my sessions were like little islands in a vast space of ‘other’. All of a sudden, therapy, which is such a dominant part of my life, felt as though it had shrunk, to be a tiny proportion of my week. I knew that just because I wasn’t emailing my therapist, that didn’t mean I either should stop, or did stop, thinking about her. I was still going over sessions in my mind, and still thinking about what I wanted to talk about next; I was still keeping my therapist very much in mind. But somehow this thread that previously felt as though it ran through my entire week and permeated everything, had started to feel instead like three drops in a very large and dilute ocean. And I felt very alone in that ocean. It didn’t even occur to me that Fridays might feel different now. Friday is my only morning session, and without having already spent a day at work, the version of me that turns up to session on a Friday is often more open and much more vulnerable, right from the start, than the ‘me’ who begins my other sessions. I usually allow myself to feel more, on a Friday. Or perhaps the feelings are just closer to the surface. And so Friday sessions tend to feel quite intense and emotional, particularly towards the end, as the most difficult material takes a while to work up to. I often used to email my therapist within an hour or two of my Friday session, while I was still caught up in the emotion triggered by it. However, this time, the last fifteen minutes of Friday’s session were different. We had talked about a couple of dreams, in connection with some very difficult events two weeks ago. We had made some uncomfortable and upsetting links. I closed my eyes, and didn’t speak. I knew my therapist would eventually ask me what had come to mind – and she did. But I stayed silent for a while longer. The difficulty is that sometimes I freeze, and nothing comes to mind. Or rather, nothing comes, apart from a single phrase or image or feeling, blocking the space so entirely that absolutely no other thought is possible. The freezing can be caused by fear, or distress, or anger – perhaps by any strong emotion. Sometimes it’s caused purely by the heightened discomfort of feeling as though I don’t have anything to say. My therapist says that we can wait to ‘see what comes up’ – but I feel paralysed, not knowing how to move forward – and so my mind becomes paralysed. The only thought in my mind was ‘I must not feel’ and my every effort was consumed with ‘holding things in’. If I didn’t allow myself to cry freely, I could contain the emotion. And I was determined to contain it, because what else was there to do? I remember saying to you: “I feel like I did when I was a little girl. When I decided I wouldn’t allow myself to be affected by death anymore…..I want to let go, but I can’t let go, because in fifteen minutes I have to leave here and deal with this alone until next week. And so I cannot feel”. We seem to have recreated the past again, between us. That is therapy, after all. You said that this time things can be different because I have internal resources – an internalised therapy-mother – which means that I do not have to deal with my emotions alone. I do not have to refuse to feel them anymore – it might have been safer then, but it is no longer necessary now. I didn’t anticipate this recreation – but why not? The last few weeks have revealed how much I trust you, how determined I am to really connect and be open – and so it seems strange to see how easy it is to fall again into ways learned in childhood, despite how different the situation and our relationship, are, to the past. After all, I chose this – I said that I wanted to do something different with email. You said you thought I was ready, but it was important that I chose it, rather than feeling it was something that I had to do. So why the same old determination not to feel? Surely I knew my choice would have consequences…..
A few weeks ago you made the point that I was holding you at arms’ length and that I was relating more to the version of you inside my head, than I was to the person sitting in front of me in session. I hope I have managed to change that a little, and to engage more with you; but it seems now that it is my internal version of you, instead, that I am keeping away. Unlike previous weekends over the last few months, not once, last weekend, did I think about the ‘internal parts of me’, or use images of those parts or of my therapist, to comfort myself. Any awareness of an internalised therapy-mother was absent – and the images that came to mind during my yoga class last week, illustrated that in a very obvious way. My therapist was trying to reach out to comfort me, but my conscious mind was not allowing her through. And yet my experience of the therapeutic relationship, and my internalisation of my therapist, were the very means by which I should be able to do things differently now, rather than simply repeating a childhood pattern with the same old outcome. It is in doing things differently, that I am meant to be healing. But what was true of the previous weekend, has been true of this one as well. I have thought about my therapist a great deal, and about various aspects of our therapy. I have tried to make sense of things, wondered about what might help, thought about metaphor, and music, and words. But I haven’t turned my awareness properly inwards. I haven’t tried to lean on my internal therapy-mother. Or on anyone at all. I think I’m waiting, but I’m not sure for what. You should be glad – you have so often encouraged me to ‘wait’ and see what comes up, when I have impatient to move on and frustrated at my inability to do so. I have the sense that I don’t want to rush through this recreation just yet. I wonder why? Maybe I want my right to feel angry and frustrated. Maybe I want to fully experience the resentment of not being able to tell you everything I’ve thought about, dreamed about, and done this weekend. There is so much I want to share with you and I’m not able to put it into words. “You know that I will be here on Tuesday”, you said. I do, and I know that then I can put these things that I have been dreaming, reading and discovering, into words. Then I can tell you what I’ve been thinking and doing this weekend. And I know that one of the main reasons for doing something different with email, was precisely that – that we should engage more fully in person rather than remotely, and that we should share these things in a more meaningful way, that contributes actively to the therapy. I know, intellectually, that that way lies relationship building, not simply information relaying. And yet…..perhaps it is simply a new-generation intolerance of anything other than instant gratification and communication. “But”, I think to myself, “with all of that to tell and talk about, we will get so behind!”. “But we cannot ‘get behind’ in therapy, this is all a part of the work!” – that sometimes-irritating (yes, because it’s right) little voice-version of you inside, says…..ah, there you are, still breathing, after all, internal therapy-mother……. But at the same time I want to wait. I want to let this frustrated girl inside me have her day – I don’t yet want to shut her down. I think I’m also waiting until I’ve finished reading ‘When Marnie was there’ (a children’s book that I recently rediscovered) for the second time in a few weeks. Anna, the main character in the book, is so much like me (or I, like her), that perhaps I am expecting her transformation, by the end of the book, to have magically become my transformation, as well. Or perhaps I’m waiting for a line from a poem, or a paragraph from a book, or a melody from a song, or a section of a dance – to be the meaning or the metaphor that turns the key and releases what I’m holding in. Perhaps I’m hoping that one of those things might come from my therapist. I’m aware that I’m looking for answers from the outside; and that that may not be the best place to be doing my looking. Tonight at yoga class, when it came to the images in my head, I couldn’t even get onto the beach that is my safe space during meditation. There was a giant blocking the way. Or perhaps an enormous, overgrown child. “Who are you?” I said. But there was no reply. There was also no getting past, and so in my mind, I disappeared into Anna and Marnie’s world, instead. And there I met another internal character I hadn’t come across before. She was a mysterious (but light-hearted), dark-haired shape-shifter. She kept transforming both herself, and the objects around her. And when I asked her who she was, she replied in just the sort of tone with which Marnie sometimes affectionately teased Anna, and said: ‘I’m you, silly!’ . I should have asked her why she didn’t just make the overgrown child disappear in the way that she herself kept vanishing. Instead I thought that she was a strange sort of comfort, though not around long enough, at any one time or in any one form, to put her arms around me, like you used to do when you entered my daydreams. For some reason, the end of the film ‘Predestination’, comes to mind. I think it is because earlier today I really wanted to send my therapist a brief email to tell her that I miss her. If Marnie (from ‘When Marnie was there’) plays a role a little like that of a therapist, so too does the Bartender in ‘Predestination’. In both cases, issues of identity and relationship with self, define the main characters. Memory, time, re-experiencing, parts of ourselves – all of these are important, in both stories. A present experience of the past becomes a powerful transformation for the future, in which the past is re-experienced differently. “Can we change our futures? I don’t know. The only thing I know for sure is that you are the best thing that’s ever happened to me. I miss you dreadfully”. Categories: Therapy | Tags: awarness of internal parts, borderline personality disorder, BPD, contact with therapist outside sessions, email contact with therapist, film predestination, therapeutic relationship, therapist as mother, therapy, when marnie was there | Permalink.